During the third semester students have to fulfil a MATLAB® programming project. One of these projects was realised by Victoria and Annika together with two fellow students. It was a quadcopter failure simulation which will be used in a later task to analyse failures of individual motor shutdown or a total shutdown and visualizes graphs and animations. The main goal of this project was to create quadcopter failure simulations on MATLAB® and Simulink®. The variables of the simulations would be saved in a multidimensional matrix, which can contain millions of simulations worth of data. This data can be read into Artificial Intelligence, which would then be able to recognise the type of failure as it is happening in real-life and combat it. 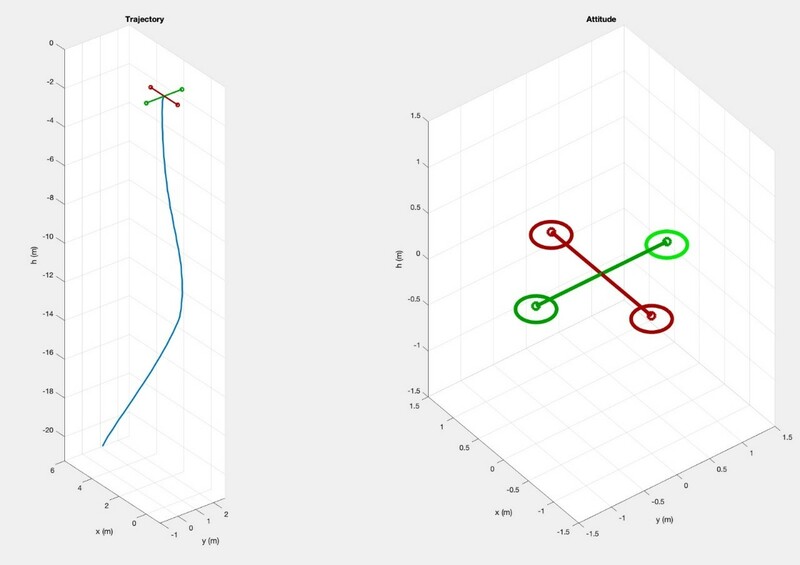 This was achieved by expanding on an already existing MATLAB® code, which simulated a quadcopter in stationary flight. The program expansion included the implementation of shutdown variables, interpolation of data, implementation of a regulator and the creation of a graphical user interface. The GUI enabled the user to choose the desired parameters of flight. 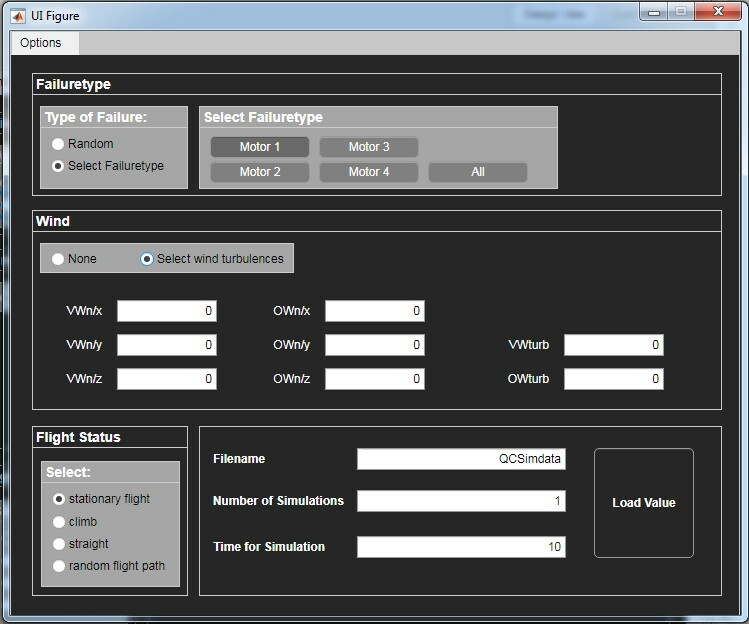 The user can choose from a list of simulation options, including the type of flight, type of failure, time of the failure, time and number of simulations, wind velocity and wind angle. The settings can also be set to random. The program then shows a simulation of the desired flight and failure of a quadcopter, and plots how the various variables are affected over time. 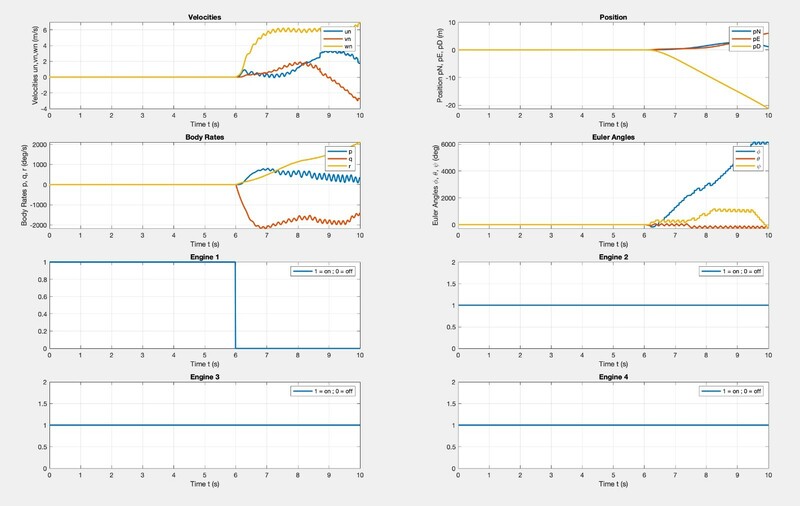 The system also allows the plotting of variables from multiple simulations to observe how the different failure modes lead to different plots on the same graph.